Thanks for your participation in SEP Conferences last week. As a school we value parents as a critical partner in the education of our students. I hope you found value in visiting our school and spending time in your child’s classroom. Let’s continue to work together! March is a busy time here at Heritage. This week is our annual Heritage Leadership Night. It will be Thursday, March 7 beginning at 6pm. Plan now to attend! You’ll see amazing artwork, participate in meaningful learning activities, enjoy dinner together and every student will take home a free book to add to their personal library. CLICK HERE for more information! Shout Out to Heritage Teachers! Woot Woot!! I am impressed daily by the outstanding teachers here at Heritage. They work tirelessly to create meaningful learning opportunities for your students. I admire them greatly. I believe we’ve got the very best here at Heritage and I love to rub shoulders with them each day! There are a number of events happening here at Heritage that I would like to share. I knew one day I would have to send an email like this and I count myself fortunate to have been able to work at Heritage for this long. Every few years the WCSD School Board rotates principals and this year I am among the principals being rotated. I will be moving to Crimson View Elementary with a start date of March 18, 2019. Heritage Elementary will be in good hands with the new principal, Amy Wilcox. She has been the principal at Coral Cliffs Elementary for the past 9 years. She is a strong principal and has many talents. I have known her to build rapport with parents, faculty, and students. She is also creative when making decisions that will impact student achievement. I believe you will find her to be compassionate, kind, and very sensitive to the needs of each one of our learners and families. I am sure you will grow to love her! I appreciate the support and love I have felt as I have worked at Heritage these past six years. I have had so many amazing experiences and developed friendships with many of you that will always touch my heart. Your children have been such a wonderful part of my life and I treasure each one of them. I will always be grateful for Heritage and the many memories and experiences that I have had here. Heritage will always hold a special place in my heart. Please give a warm welcome to Mrs. Wilcox and carry on as you always do! Heritage is a fabulous school and I hope it will always remain that way. Can you believe that Christmas is nearly here and it will be 2019 before we know it!? I hope that each one of you are enjoying this wonderful time of year. It certainly is a little more cheery and exciting here at school. 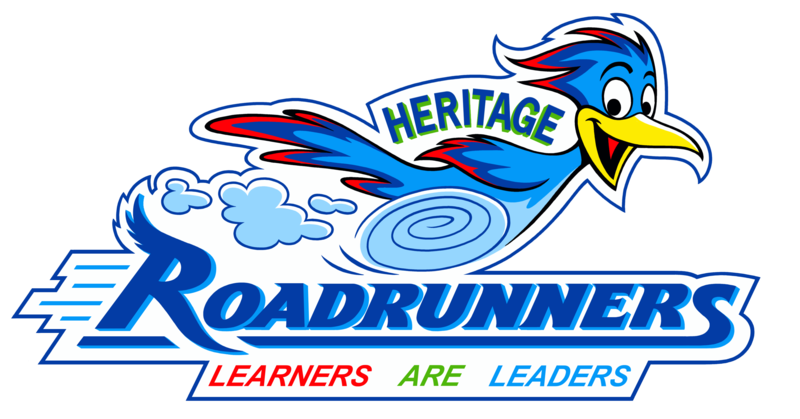 Today we had our Roadrunner Rally with our Habit Leaders and Academic Leaders from each classroom being cheered on as they ran through our hallways! I love to celebrate our students and the great things they are accomplishing here at our school. Lately I’ve noticed that we’ve had more tardies than normal as well as many students being checked out early. Please remember our goal for On Time ALL Day attendance. Being here on time and staying all day is so important for your child’s academic well being. As I’ve stated previously, our teachers are dedicated professionals who strive to plan and make every minute count in your child’s day. Please do all you can to have your child here on time each day. Additionally, please do all you can to have your child remain at school through the final bell each day. REMINDER: Next Monday, December 10, we will be an early release PLC day (we will follow our Friday schedule in Kindergarten and grades 1-5 will dismiss at 1:15). These days are important for teachers and are used to attend trainings and grow professionally. This Monday our teachers will use the time at Heritage to work on building safety, as well as helping build expertise in handling various behavior challenges that may arise in their classrooms or at our school. Thanks for all the support you provide your student and our school. I love working with your children, it is so rewarding to learn and laugh with them each day! Wishing each of you the very best this Holiday season! If you need assistance with Christmas this year, please see our school counselor, Emily Sharp, before the Thanksgiving break (11/20) for a referral letter to KONY Coins for Kids. The counselor will provide you with additional instructions. Si necesitas asistencia para la Navidad este año, por favor vea al consejero de la escuela antes de las vacaciones de Acción de Gracias (Noviembre 20, 2018) para conseguir una carta de referencia. El consejero de la escuela le dará instrucciones adicionales. Item #3 – Absences and Tardies – Remember our goal of ALL day EVERY day attendance. Do all you can to get your child here on time each and every day. Our teachers work tirelessly to create and prepare lessons and learning activities that will challenge and engage our students and many teachers begin those activities as soon as our announcements are over each morning. Additionally, school dismisses at 3:30 most days and at 1:15 on early release days. As much as possible appointments and other conflicts should be scheduled after our release time. Thank you! I look forward to seeing each of you during our SEP week! SEP Conferences will be the held the week of November 12 thru the 16. Students in grades 1st thru 5th will dismiss at 1:15 the entire week (11/12~11/16). There will be NO kindergarten on Monday and Tuesday for SEP Conferences. Kindergarten students will resume school on Wednesday and follow the early release schedule for the remainder of the week. The scheduling window for parents is now open (and will be until midnight on Nov 7th). Please click the logo below to go to the Online Scheduler website. Additionally, step-by-step instructions are also available by clicking the link below (the school password is “roadrunners“). We hope that you will take the time to schedule and attend your SEP conference with your child. As parents, students, and teachers we must all work together to ensure the BEST education for your child! Thanks for your continued support of Heritage Elementary! CLICK HERE for Online Scheduler Parent Instructions. We had our first parent night of the year last night. It was well attended and full of great information. Our School Counselor Mrs. Emily Sharp presented on local community resources that are available to help our students and their families. Everything from food, clothing, housing, health care, and other types of needs that are students and their families face were presented. CLICK HERE to view the presentation from Mrs. Sharp. Additionally, Mrs. Webb and Mrs. Bundy shared with parents about the Move This World program that we are participating in this year. This program is a very brief part of each morning as our students start the day and again a brief moment at the end of the day with each of our classes. At the beginning of the day students watch videos about handling their emotions and working well with others. If you hear about “emogers” or the “emotional ABCs” from your student, that is all part of this program. We believe that our students have enjoyed participating and are learning about themselves and how to appropriately handle their emotions. We look forward to many more informative parent nights as the year progresses. Halloween is a fun, exciting, and fairly crazy day at school. We anticipate having a great time together with our students on this day. This year we are adjusting our Halloween plans a bit from what we’ve traditionally done in the past. Instead of a morning costume parade, we’re moving that to the afternoon. Here’s a quick rundown of the day along with some costume guidelines. Morning (before lunch) – “normal” day with fun Halloween related learning activities. After lunch students will have an opportunity to change into costumes and participate in classroom parties and other fun Halloween activities. 2:30 Costume Parade – Parents and family can best view our costume parade at rear of building. The parade will zigzag across the playground. The costume parade will conclude at approximately 3:10pm and parents will have the option to take their student(s) home with them at that time or have their student stay at school and dismiss at the regular time (3:30pm). El Día de Brujas es un día divertido, emocionante y bastante loco en la escuela. Esperamos tener un gran tiempo junto con nuestros estudiantes en este día. Este año vamos a cambiar nuestros planes un poco de lo que hemos hecho en lo pasado. En vez de tener un desfile de disfraces por la mañana, lo haremos en la tarde. Esto es el horario y algunas pautas sobre los disfraces. Por la mañana (antes de almuerzo) – Un día normal con actividades divertidas de aprendizaje relacionado con el Día de Brujas. Después de almorzar, los estudiantes tendrán la oportunidad de ponerse sus disfraces y participar en fiestas en sus clases y otras actividades divertidas. 2:30 Desfile de Disfraces – Padres y otros familiares pueden pasar por atrás del edificio para ver el desfile. El desfile pasará por el patio de recreo. El desfile de disfraces terminará como a las 3:10 y los padres pueden llevarlos a sus hijos si quieren hacerlo. Los demás estudiantes quedarán en sus clases hasta las 3:30 pm. ➔ Los estudiantes deben traer sus disfraces y tendrán la oportunidad de ponérselo después del almuerzo. ➔ Los estudiantes deben poder ponerse su disfraz por ellos mismos (pueden practicar en casa). ➔ Los estudiantes deben poder usar el baño sin ayuda.